Explain the differences between mobile and desktop usage. Discover your users’ mobile Salesforce requirements. Define and prioritize appropriate mobile use cases. Before we get into the nuts and bolts of developing your rollout strategy, we need to tackle something a little more abstract: a shift in your mindset. When approaching a mobile rollout, many customers make the mistake of trying to replicate their desktop Salesforce experience on mobile. It’s a bad idea, and here’s why: People interact with mobile devices much differently than laptops. Think about how many times a day you pick up your phone. Fifty? A hundred? (Don’t worry, you’re not an addict—we swear.) In fact, according to the 2013 Internet Trends report, most people check their phones 150 times a day. And guess what else? Flurry Analytics found that users spend 177 minutes on their phones per day. Do the math. That means the average mobile session is about 70 seconds long. Pretty mind-blowing, right? Now store that number away in your brain because it’s the key to making the shift to a mobile mindset. Unlike the long sit-down sessions that are common with laptops, people interact with their phones in a series of brief and frequent bursts. Generally they’re trying to accomplish a specific task—like getting directions or checking their calendar—and they don’t have much time to do it before getting pulled away or distracted. We call these interactions micro-moments: the point in time when someone uses their phone in context to take a quick action or consume information. And on average, these bursts of focused activity last about a minute. Now, don’t go discriminating against micro-moments because they’re so tiny. The short time span isn’t a limitation—it’s an opportunity! You have a chance to intercept your users at critical points during their day, anticipating their needs and helping them work smarter. 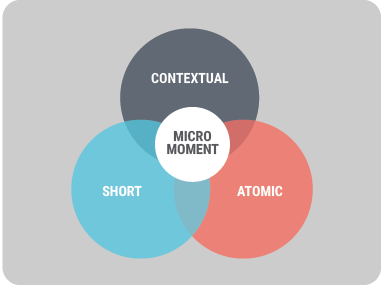 Micro-moments are powerful because they encourage a certain kind of interaction, one that is short, atomic, and contextual. Short: The interaction is brief. The time it takes to complete is no longer than a minute and a half. Atomic: The interaction is discrete and focused. It’s one workflow or activity, and the interaction isn’t dependent on other things. It doesn’t require users to jump outside of their flow to go complete another action somewhere else. Contextual: The interaction happens in real-time, and it’s related to the user’s current situation. What’s the user doing now? What does she need? Where is she? What’s next on her calendar? If you can deliver value to mobile users during these micro-moments, then the Salesforce app will become an indispensible tool that makes their jobs easier. You’ll be a hero to your users, and you’ll drive your overall adoption of Salesforce, too. Win-win! So how do you help users take advantage of these micro-moments when they have a minute or two to get something done in the Salesforce app? Start by looking at your Salesforce implementation through a mobile lens, and break down your business processes into bite-sized chunks. Which tasks can be accomplished quickly on a mobile phone? Try to identify time-saving scenarios that address what your mobile users need most. Those scenarios will become your initial use cases. Anyone in your business could use the Salesforce app, but we recommend you start with your road warriors—the users who are constantly on the go and away from their desks. Focus first on key roles within your sales and service organizations because you’re more likely to discover high-value use cases with those groups. If you’re a Service Cloud customer, target your field service reps. If you’re a Sales Cloud customer, come up with use cases for your field sales reps, as well as sales managers and executives. After you tackle your road warriors, develop use cases that apply to other groups of users. A potential mobile user is anyone who would benefit from using Salesforce in a variety of settings: while commuting, in line at the coffee shop, or at their child’s soccer game. There are even times that employees might use the mobile app at their desks. Skeptical? Well, what happens if the Internet goes down, the power is out, or a laptop dies? Having mobile access means your employees can continue working in Salesforce without interruption. Maybe you’re already bursting at the seams with ideas for mobile use cases. But if you’re just starting to shift into the mobile mindset, you might need some inspiration. If that’s the case, check out our e-book, 100 Ways to Run Your Business from Your Phone, which is full of mobile ideas from actual Salesforce customers. In addition to sales, service, and marketing use cases, you’ll find cool examples of how the Salesforce app can be used in IT, operations, HR, and more. Before you get too far with all your brilliant ideas for mobile use cases, let’s stop and get input from someone really important: your user. What do your users really need? What are their pain points? Put yourself in their shoes and do whatever it takes to get their perspective. Because the truth is that your users won’t adopt the Salesforce app if it doesn’t provide value and make their jobs easier. You have to balance the needs of the business with the needs of your users. And the best way to find out what your users need is to–gasp!–go talk to them. (Shocking, we know.) Seriously, though. If you spend a day observing users and asking questions, you’ll discover opportunities for mobile that you otherwise never would have imagined. Although it requires the biggest time investment, you’ll learn the most about your users by doing a ride-along. There’s really no substitute for witnessing your user’s successes and struggles firsthand. What kind of questions do customers ask them? What information would it be useful for them to have at their fingertips? Which tasks are the most frustrating or time consuming? Are they carrying clipboards, printouts, or spreadsheets? Using sticky notes? Are they capturing information in consumer apps like Evernote or Dropbox? Can you give them an easy way to store that data in Salesforce? Hopefully we’ve convinced you that it’s worth your time and effort to observe users in action. But no matter which research method you choose, just remember: be a good listener and take thorough notes. Sales reps are too busy to transcribe their meeting notes after a customer visit. They sometimes forget information that might help them with a sale. Create a Quick Log a Call custom action. Default the date and the type of visit, and provide a Description field. Using their phone’s speech-to-text feature, users can dictate their notes into the Description field, which takes less than a minute. No typing required! It’s a hassle for sales reps to access product datasheets. They have to look in a binder or call the office. Create a dedicated Chatter group where the marketing team can post datasheets. Mobile users can easily view the most recent file from their phone. Sales reps often don’t have time to call HQ and place an order right after a meeting. There’s a lag time between the customer’s order request and the order placement. Create a custom action called Place an Order. The user completes a few required fields, and the update kicks off a workflow that sends an email to customer service. The email contains just enough information to get the order started. Now reps can place orders while they’re sitting in front of the customer. Keep in mind that many use cases simply involve standard out-of-the-box functionality packaged for micro-moments. Take the example of the Quick Log a Call action. Users already have the ability to log calls in the Salesforce app. You’re just giving them a shortcut that makes it easier and faster to perform that particular action in context and on the road. We know you’re chomping at the bit to learn how to implement some of these use cases. Never fear—we’ll cover the basics of customizing the mobile app later in the module. Between your own ideas and the input you received from users, you probably have a ton of potential use cases. How do you figure out which ones are the best? It’s designed for micro-moments. The interaction is short, contextual, and atomic. There’s value for the end user. The use case will benefit employees and make their jobs easier. The business impact is high. You can tie the use case to a KPI or an important business metric. You should be able to measure the value the use case will bring to your organization. We know you’re stoked to share all these amazingly practical mobile use cases with your users, but you’ll have to show a little restraint. Sorry to be a buzzkill, but your users can only digest so much new functionality at one time. Start small and iterate. For your mobile launch, it’s a good idea to pick your top three use cases. On the horizontal axis is ease of cultural adoption. Evaluate each use case and decide how much work it will be to change your users’ existing behavior. On the vertical axis is business impact. Rank each use case according to how much value it will add to your business. Plot the use cases on the graph to see where they fall. Our advice? Focus on the quick wins and low-hanging fruit first. There are plenty of mobile use cases that fit into these two categories, which are high value and easy for your users to adopt. You probably came up with some use cases that could have a major transformative impact, but they usually require more extensive planning, resources, and technical skills to implement. 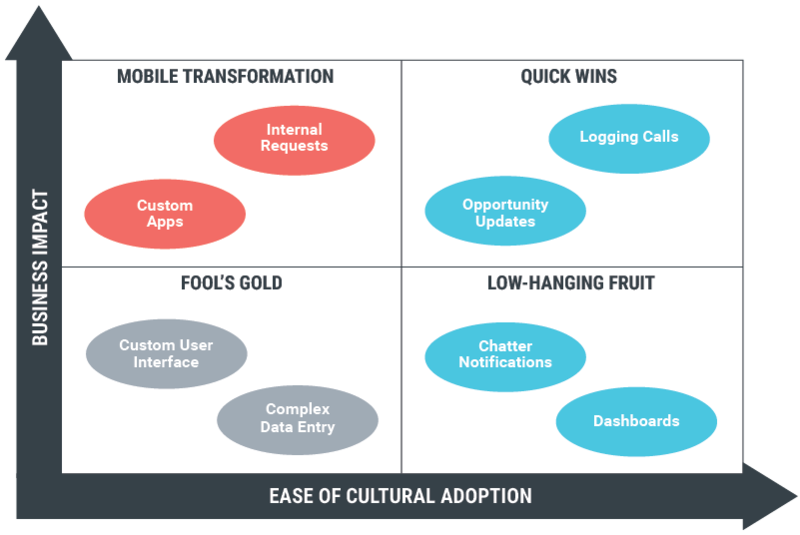 Tackle those larger mobile initiatives during a later phase of your mobile rollout, after you’ve reached a baseline level of mobile adoption with the quick wins and low-hanging fruit. OK, now that you’ve prioritized your mobile use cases, it’s time to educate yourself about the Salesforce app so that you can become your company’s trusted mobile advisor.